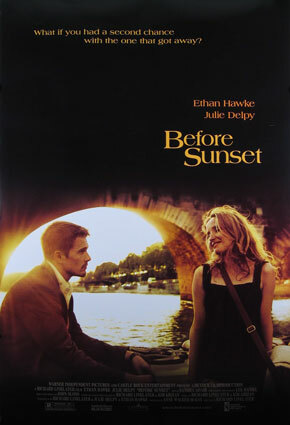 BEFORE SUNSET, Richard Linklater’s sublime 2004 sequel to his much loved indie hit BEFORE SUNRISE (1995), is one my favourite films. Aside from the fact that, like the first film, it massively appealed to my inner romantic, it’s a film that ‘spoke’ to me in a way that few other films have, given the circumstances of my own life at the time. Beyond that, I always identified strongly with the films’ star-crossed lovers, Jesse (Ethan Hawke) and Celine (Julie Delpy), in so far that I was roughly the same age as them (younger by a year or two at most) and intrinsically recognised their youthful idealism and dreams in the first film and their potent anxieties and fears in the second. Fans of naturalistic dialogue have a real feast in SUNSET – much of it crafted by the two stars drawing on their own life experiences (Hawke perhaps a little too closely, given that his marriage to Uma Thurman was heavily faltering around this time). Consequently, the level of naked emotional honesty on display is often breathtaking, especially in the climactic taxi ride where the duo’s souls are truly laid bare to each other. I, for one, am always struck by the sheer bravery of Jesse in that scene when he confesses to Celine “I think I might have given up on the whole idea Romantic Love, that I might have put it to bed that day you weren’t there. I think I might have done that…” – which is a hell of thing to admit, given that it exposes his marriage and fatherhood as acts of expected responsibility. Indeed, it starkly underlines that his earlier jokey, mock-petulant attitude to the pair’s missed meeting in Vienna (“It’s no big deal! I flew all the way over there, you blew it off and my life’s been a complete nosedive since then. I mean it’s not a problem! I’m kidding, I’m kidding…!”) was in fact barely-concealing his longstanding stinging regret. 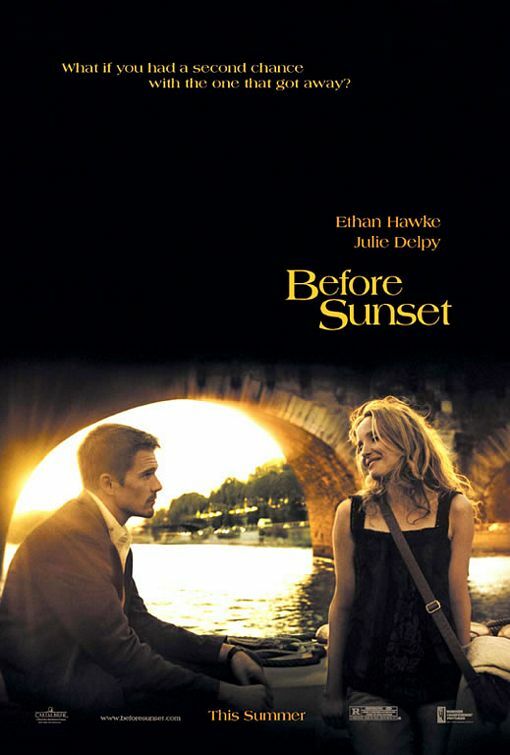 The film opens with a montage of Parisian locations, beginning with a residential alley and followed by a non-descript street, a boat on the Seine with Notre Dame Cathedral in the background, a bench-lined pathway, a tree-lined street, Le Pure Cafe, a narrow street, a pathway behind a church, a brick-covered pedestrian area and finally, the Shakespeare’s and Company book store, where we see Jesse doing a reading from his book and where he will shortly meet Celine again after nine years. However, this montage of pleasant locales is not random: it’s actually Jesse and Celine’s walking route through the movie in reverse, so the first shot is the location of Celine’s apartment and where Jesse ends up, smiling incandescently as Celine dances to Nina Simone. So, regarding the film’s central question of whether Jesse and Celine end up together, Linklater technically gives it away with the first frame…! !